VIDEO: 3 Really Unique Ways To Make Halloween Party Invitations! This video shows a fun way to get your kids involved in making Halloween invitations that you’re going to hand out — because they’re too bulky to mail. It’s a really clever idea: hand-write all of the details about the party on a tiny pumpkin! A good friend of mine wanted to make handmade Baby Shower invitations and came up with a dilemma – How can you make sure that the guests know that the excited Mother-to-be is expecting TWIN BOYS? Here is a simple handmade Christmas card using a cheap and simple piece of patterned scrapbook paper. 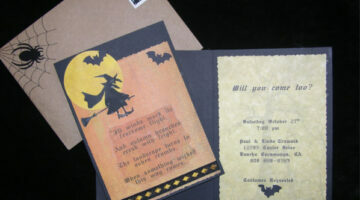 A Halloween party invitation that will impress your friends, plus lots of ideas for hadnmade Halloween cards and invitations. I found a sheet of Halloween stickers and a sheet of Halloween rub-ons that would be half the price of one stamp, and leave me with more images then I could possibly use for one Halloween season. Tis the season for parties and cookouts. Before your guests walk in the door, you have an opportunity to set the tone for your get-togethers by sending handmade invitations. 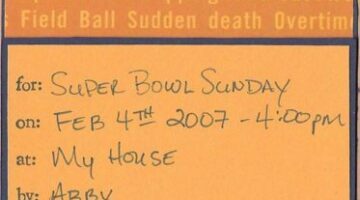 Why not make your Super Bowl Party invitations?